When I signed up for this race back in June, I really thought I would be in better shape. I thought for sure I would break 1:30 and was even thinking I could be closer to 1:28. But throughout the rest of the year my run training was very inconsistent for one reason or another and frankly the mileage was just not high enough. I knew going in that running a 1:30 was probably not going to happen based on all of my long run paces, but I figured I would still try for it. 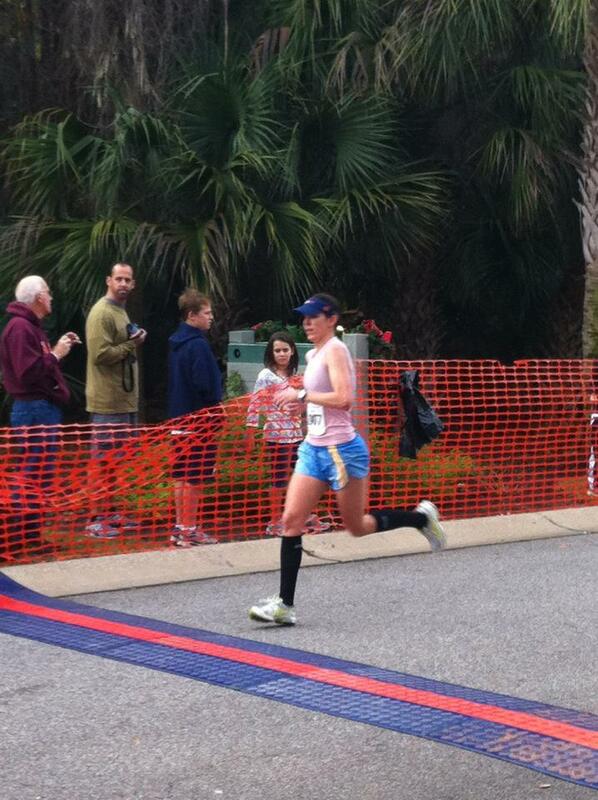 As Kari put it, "a sub 1:30 was ambitious...not absurd, but ambitious" She was so right on. And so you can just skip to the ending, I ran a 1:31:10. There were 8 of us traveling down to Kiawah Island, South Carolina together. 7 wimmins and 1 dude. It was a fun crew. And that is sort of an understatement. 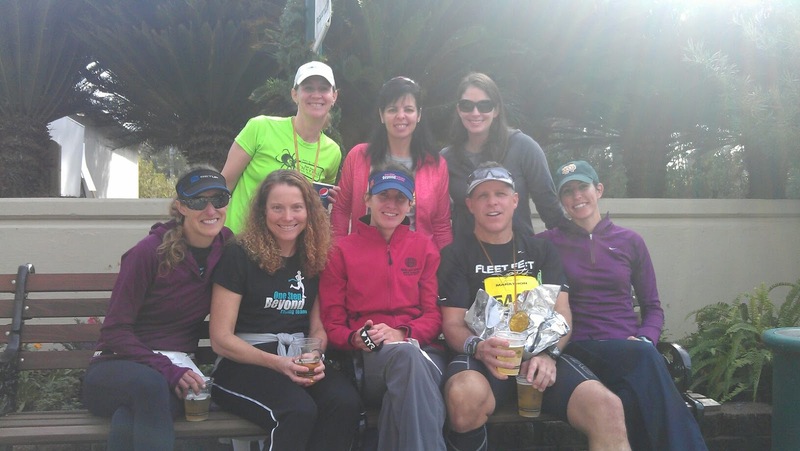 We (and when I say we I mean Heidi and Michele) drove the 6 or so hours straight to packet pickup. I had been waiting for this day for a long time because Kari had registered me and had written in a secret nickname for my bib number. She refused to tell me and with her I was never quite certain what might show up on there. She teased me saying things like "Suckit" "Nice to beat you" "I'm pretty good at winning" but when it was said and done the stupid bib number just said "Bri" You could hear the screech from across the room when Kari saw that what she had written wasn't on there and I was also disappointed. ESPECIALLY when she told me that she had written "Logan's Mom"
Pre-race antics ensued which included lots of outfit, food, poop, compression, etc discussions. Then we went to sleep and the talk continued throughout the morning until the start. Although some topics were continued and thoroughly covered througout the weekend. 8am start - me and Mayhew lined up several rows back but not that far back for the amount of people we had to weave through the first mile. We both didn't really have any business gunning for a 1:30 but we did it anyways. First mile was right on (or close enough), the next 3 were just below which gave us a nice cushion. Kari backed off after that and I was left to my own devices. Miles 5-9 were held nicely and I still had a bit of cushion for the sub 1:30. Then mile 10 happened and it was gone. The last 3 miles were typical of most people's half marathon races I imagine. I felt like I slowed down to a jog but it actually wasn't horrible. Just that little bit slower felt a lot better and I don't have the mental capacity to push through the hurt at this point. For me that comes with being in better shape. Some girl passed me at mile 13 and I was all set to let her go before I yelled at myself and put in a great sprint for the last 30 yards. Go me. Final time: 1:31:10. We watched the rest of the crew finish, including our two marathoners before relaxing in the afternoon and getting ready to have a night on the town in Charleston. What a great city! We had a delicious meal at a brewery and plenty of alcohol. Some of us had more than others. 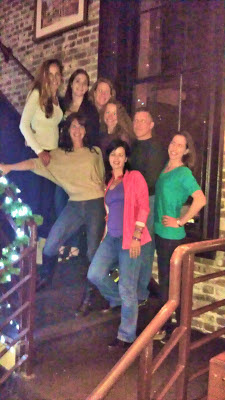 Half the group stayed out very late for more shenanigans and took an hour cab ride back to Kiawah. Post dinner in Charleston. I'm posing Glamour Shots style. Sounds like an awesome weekend! 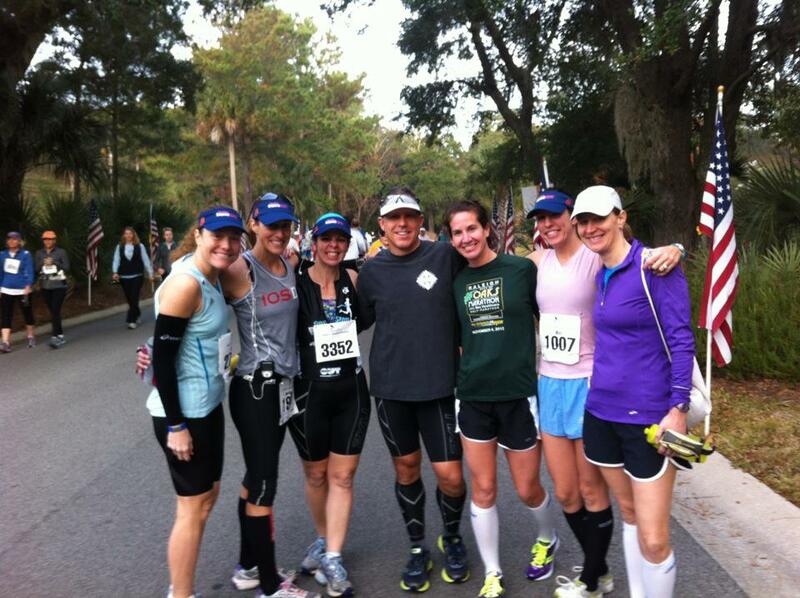 My parents live very close to Kiawah Island so I have thought of that race before. Congrats on a great time! !